To all Clare Band Alumni and friends of Lloyd Conley. He will celebrate his birthday on March 8th. If you wish to send a card, Lloyd=s address is: 323 St. Clair St., Rodgers City, MI 49779. The entry fee will be $20 per fisherman, 70% of the entry will be donated to the family. Co Directors:Justin Evers 989 802 3832 & Dustin Marshall 989 802 1099. All state laws will be enforced; shanty inspections will be randomly done at the director=s discretion! Please, this is a family friendly event for someone who needs our help! Anyone who disobeys rules and regulations will be disqualified without hesitation or returns! Vol. 133 Issue 9 is Here! 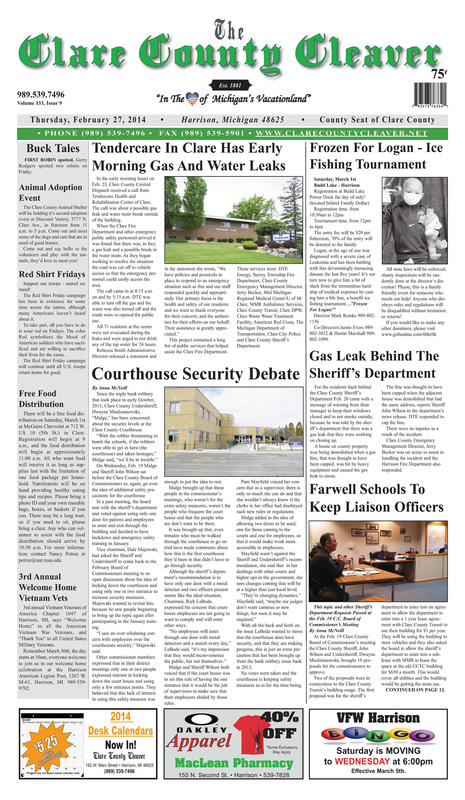 Check out this week’s front page! This week’s paper features stories and updates about what is going on with the Clare County Sheriff’s Department, the Frostbite Winter Festival winners and photos, upcoming events and meetings, two different gas leaks in Clare County and much more! Get your copy of this week’s paper for only $.75! This week the story about the Chainsaw carvers from the UP will be in our paper. Last week we simply couldn’t fit the story in, but look for it this week! For the first time, the Frosty Dip was a success with many people taking the plunge into ice cold Budd Lake. Check out our Facebook photo album at https://www.facebook.com/media/set/?set=a.737991352880128.1073741842.151577951521474&type=3 to view all of the photos from the Frostbite’s version of the Polar Dip. Check us our on Facebook! Click the link to visit our Facebook page and contact us!